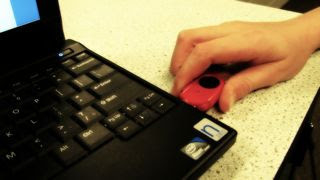 When the idea of students using flash drives (or thumb drives, or USB drives, or whatever you want to call them) first occurred to me I thought "This is going to be great! No more troubles with students taking files to and from the school to their home computers." Although my idea was great, the practice of this idea was horrible. Have you ever had to deal with any of these situations? 1) Student: Mr. Flickinger have you seen my flash drive? It has my report on it and I need to print it out and turn it in. Me: Does your report live anywhere else but on your flash drive? Student: No. 2) Student: Does a flash drive still work if it has been through the washer and dryer? 3) Student: Mr. Flickinger my flash drive doesn't work any more. Me: What are these marks? Student: Oh yeah, my dog chewed on it a bit. Me: Are you kidding me, you are trying the ol' THE DOG ATE MY HOMEWORK line? By trying to solve one problem with technology, in this case a simple flash drive, I created an even bigger one. Welcome to the world of a tech integration specialist.